It’s summer time, 1957. Early on a Sunday morning, a young woman is found dead in the street. She’s been murdered and thrown away like a sack of garbage. Hours later, a second woman is pulled out of the Crawfish River, another victim of a brutal killing. Chief Augie Austin, Columbus’ top cop, suspects that he may be dealing with a serial killer. But, when the clues send him in two different directions, he realizes that is dealing with two murderers, not one. Austin’s peaceful world is turned upside down, as he realizes that Columbus is not the unspoiled, perfect little town he thought it was. As he interviews witnesses and friends of the deceased, he finds himself up against one road block after another. People aren’t talking and he wants to know why. As the evidence builds, Austin recognizes that it is pointing to one of his own officers. Already suspicious that this cop has been bending the rules for personal gain, Austin realizes that he may have a murderer patrolling his streets. 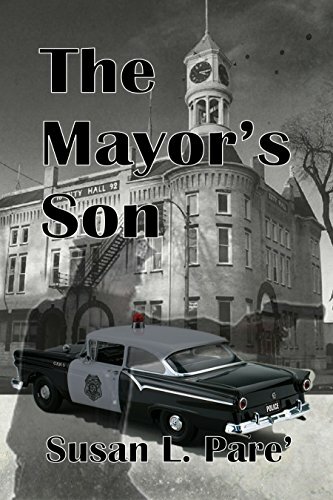 Knowing he must tread carefully, Austin sets out to build a rock solid case against Officer Drollstrom – the Mayor’s son. A mystery set in your small home town can be unnerving. This story takes place almost exactly 4 years before I was born. With all the real places, businesses, streets, homes and character names similar to their real ones or descriptions clear enough to recognize who they were based on had me thinking parts of the story could come from actual events, I mean I wasn’t around . . . but the real mayor’s son at the time has assured everyone it is purely fiction. When a young woman is found dead near the town’s only set of stop and go lights “the four corners” and a second woman is pulled from the river Police Chief Augie Austin fears Columbus may have a serial killer. Trying to find a link between the women is tough because no one will answer his questions. Like him, most residents of this small Columbia County town can’t believe this happened in their close knit community. The investigation starts to move forward when the results on evidence from the crime lab start to come in and they are pointing to one of his own officers. The guy is lazy as they come and doesn’t respect Austin’s authority, but a murderer. . . This is my first book by this author and clearly it will not be the last. She knows how to set a scene and has created unique characters. I love that in 1957 she has a capable and well trained woman on the police force. All the characters are realistic and their dialogues are believable. Her descriptions make it so easy to picture everything clearly even if you have never set foot in the city. Murder, prostitution, and small town politics, all come together in a suspenseful mystery with amazing twists and an ending you will never see coming. There is also a fair amount of humor woven throughout the story. I love my home town. Taking a step back in time was a pleasure. From the city hall, to Earl’s Cafe (where both my mother and sister worked), to the Fireman’s Tavern, the Stokely canning factory, the popcorn wagon, the Crawfish River and more brought back so many memories. I grew up there and still don’t live too far away. My dad was a milkman, a school bus driver and later the Fire Chief. My mom worked not only at Earl’s Cafe but at the garment factory and later owned a tavern with my dad. Heck, I was runner up to Miss Columbus in 1979. Life there wasn’t perfect but I wouldn’t change a thing. You can find out about Susan and her webpage here. Yes! This book is one I have to read. Thank you Lori for the review & the give-a-way.